If you have a Premium version of Cloudify Manager, an admin user can create a cluster of Cloudify Managers to enable high availability. A Cloudify Manager cluster is dynamic, meaning that you do not need to specify the size of the cluster in advance. For more information about working with clusters, refer to the CLI cluster command. One Cloudify Manager is designated as the active Cloudify Manager, and the others are designated as hot standbys, that are constant mirrors of the data of the active Manager. In the event that the active Cloudify Manager health check fails, an automatic failover switch activates one of the hot standbys as the new active Manager. Both the CLI and the Cloudify Agents will then start contacting the new active Manager. When the previous active Manager is restored to a healthy state, it will become a hot standby node, and will mirror the data of the new active Manager. The leader election is using a majority-based consensus algorithm, so it is recommended to use 3 Manager nodes for creating a cluster. The leader election and failover mechanisms are orchestrated using Consul. See the article in Consul docs to learn more about the failure tolerance for the given deployment size. All Cloudify database and filesystem data is mirrored on the cluster hot standby nodes. This includes all objects that are managed using the REST service, such as blueprints and deployments, and management data, such as users and tenants. Policies are not synchronized between Cloudify Managers in the cluster. A Cloudify Manager that is down remains in the cluster unless you remove it. To remove a Cloudify Manager, run cfy cluster nodes remove. In the event that the active Cloudify Manager fails, it is important to investigate and fix the issues that caused the original master to fail, or add another Cloudify Manager to the cluster, so that high availability is maintained, and to avoid having a single point of failure. Because operations cannot be performed on a non-active Manager, you will need to connect to that Cloudify Manager using the SSH protocol. To find the active manager in a Cloudify Manager cluster, you can either: - From the CLI: run cfy cluster nodes list. The active manager has the ‘leader’ value in the ‘state’ column. - If you have the REST API credentials, get the status of each manager in the cluster. The active manager returns a 200 response, and all other managers return a 400 response. To manage the situation in which the active Cloudify Manager fails one or more health checks, all Managers in the cluster constantly monitor the Consul next master function. When one of the standby Manager instances in the cluster detects that next master is pointing to it, it starts any services that are not running (RabbitMQ and mgmtworker) and changes PostgreSQL to master state. When the active Manager changes, the hot standby nodes begin to follow it with filesync and database. If the original active Cloudify Manager was processing a workflow at the time it fails, the newly active Manager will attempt to resume the workflow (if the workflow is not declared as resumable, it will immediately fail). If there is a loss of connection between the Cloudify Managers in the cluster, the cluster might become partitioned into several disconnected parts. The partition that contains the majority will continue to operate as normal, while the other part - containing the minority of the nodes, so usually only one - will enter active minority mode. In this mode, the node becomes active and responds to requests, but the writes aren’t replicated to the majority of the cluster, and are at risk of being lost. Therefore, it is not recommended to continue using the cluster if the majority of the nodes are unreachable, as reported by cfy cluster nodes list. When the connection is resumed, the Cloudify Manager with the most-recently updated database becomes the active Manager. Data that was accumulated on the other Cloudify Manager cluster nodes during the disconnection is not synchronized, so is lost. Create a cluster after you complete installing your Cloudify Managers. When you run the cfy cluster start command on a first Cloudify Manager, high availability is configured automatically. Use the cfy cluster join command, following installation, to add more Cloudify Managers to the cluster. The Cloudify Managers that you join to the cluster must be in an empty state, otherwise the operation will fail. The data on each Cloudify Manager mirrors that of the active Cloudify Manager. Operations can only be performed on the active Manager in the cluster, but are also reflected on the standby Managers. Similarly, upload requests can only be sent to the active Cloudify Manager. 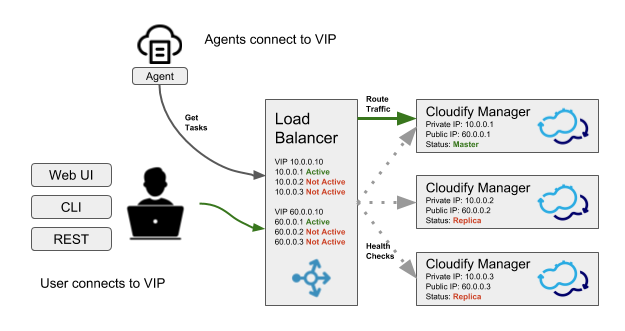 Within the cluster, Cloudify uses the Consul utility and internal health checks to detect when the active Cloudify Manager is down, and which standby will become active. Complete installing a Cloudify Manager. Run cluster start on the installed Manager to designate this Cloudify Manager instance as the active Manager. Run cluster join on two other clean Cloudify Manager instances. (Optional) To remove a Cloudify Manager from the cluster, run cfy cluster nodes remove <node-id>. The cluster nodes will try to contact the new node using the IP passed to them by the CLI. By default, this is the IP that is the CLI profile name. Often this is not desirable, because the CLI might be using an external IP, while it is preferred for the cluster to be using a private network. In that case, use the --cluster-host-ip parameter, which must be an IP that is visible by other Managers in the cluster. Hostnames are not supported in --cluster-host-ip. check_ttl_multiplier (default: 1) - a multiplier for the health check timeout. If a health check’s status is not updated for the TTL period - which varies from check to check - the check will be considered failing. This option allows changing that time. For example, setting it to 2 will make health checks take twice as long to timeout, which means it will take longer to detect a node becoming unresponsive, but there will be less chance of short-lived network failures to cause an unnecessary failover. If the network is unstable, increasing check_ttl_multiplier to 3 and setting check_fail_fast to False will help avoid unnecessary failovers, at the cost of taking longer to detect a real failure. Cloudify Manager snapshots do not include clusters. If you restore the snapshot of a Cloudify Manager that was the active Manager in a cluster to a new version, you must join the other Cloudify Managers to recreate the cluster. Managers in a cluster must all be the same Cloudify version. In this process you create new VMs for all Cloudify Managers that will be part of the cluster. Note that this procedure essentially creates a new cluster, with the data from the existing cluster. Create a snapshot of the active Cloudify Manager. Boostrap three Cloudify Managers with the upgraded version. Restore the snapshot to one of the Cloudify Manager instances. Run cluster start on the Manager with the restored snapshot, to designate this Cloudify Manager instance as the active Manager. Run cluster join on the two other installed Cloudify Manager instances to designate them as hot standbys. In this process you teardown the active Cloudify Manager and install a new one on the same VM. You create new VMs for the Cloudify Managers that will become the hot standbys in the cluster. Uninstall Cloudify Manager from the active machine. Install an updated Manager on the existing machine. Restore the snapshot to the Cloudify Manager instance. Run cluster start to designate this Cloudify Manager instance as the active Manager. Boostrap two new Cloudify Manager VMs with the upgraded version. Run cluster join on the two new installed Cloudify Manager instances to designate them as hot standbys. While using the Cloudify CLI with a cluster profile will automatically find the active node, that mechanism is not available for the Cloudify Console. To allow users contacting a known static address to access the Cloudify Console, a load balancer such as eg. HAProxy can be used. The load balancer should be configured with a health check that contacts all the nodes in the cluster in order to find the current active node, and forward all traffic to the active node. The load balancer address can then be used for both accessing the Cloudify Console, and for creating a CLI profile. To configure the load balancer to pass traffic to the active node, implement a health check which queries all nodes in the cluster and examines the response code, as described in the finding the active manager section. In the example above, 192.168.0.1 and 192.168.0.2 are the public IP addresses of the two cluster nodes, and YWRtaW46YWRtaW4= are the encoded credentials. If the active node is reachable and responding, we recommend that you to remove all nodes from the cluster before you uninstall them. This process avoids unnecessary failovers that put stress on the network and on the nodes. Run cluster nodes list and note the current active node and the non-active nodes. The following tools are used to facilitate clustering in Cloudify. The following security mechanisms are implemented. SSL is used internally. All SSL certificates and keys for clustering are stored in /etc/cloudify/cluster-ssl. The only file that runs with sudo privileges is /opt/cloudify/sudo_trampoline.py. The internal CA certificate, which is used by the agents to verify manager connections, is replicated between all cluster nodes. When joining the cluster, a new replica copies the internal CA certificate (and the key) from the active node, and uses that to sign a new internal certificate, which will be used by servers on that replica. This means that the agents can continue using the same internal CA certificate to access that replica, if it becomes the active node. If required, direct access to Consul REST API is also possible from the Manager machine: it is listening locally on port 8500, and authentication requires passing the SSL client certificate which is located at /etc/cloudify/cluster-ssl/consul_client.crt (with the key located at /etc/cloudify/cluster-ssl/consul_client.key).